Asian Size Chart: The Asian Culture is unique and eclectic, there is no denying that. Their fashion has a certain flavor that is resplendent of the East. With a mix of modesty and glamour, minimalism and extravagance – everybody simply wants a piece in their closets. But how do you go about shopping in their stores when the sizing is very different from what you’re used to? Look no further. In this guide, you will find an Asian Size Chart overview to make your shopping easier. You would think that just because you have your US or UK size knowledge down on pat, that everything else will be easier. Think again. Size standards vary everywhere. And Asian sizes are no less confusing. If you find yourself shopping in Asia or in one of their online stores, you’d probably end up with a migraine… or worse, clothing that is just too small. Let’s keep that from happening! Some countries in Asia have their own sizing system. So, it’s important to be aware of these variations when shopping in different Asian clothing stores. Below is the general overview of some countries’ sizing methods. Asian sizes may come in size standards by country. The most common you will see are sizes from China, Japan, and Korea. Sizes tend to run smaller compared to US or UK sizes. Some XXL sizes may not be available in Asian sizes. In China, they use two different systems. This is because they measure two different parts of the body. You may see, for example, that a size medium in the US is a size 88 – 90 or 165 – 170 in China. Japan uses the lettered system (XS-XL). However, you have to be cautious because these sizes tend to run smaller compared to US or UK sizes. A medium in Asian size would perhaps be small in US stores. Japan also uses two different numbered systems in sizing. So you might see sizes 9 or 38 which equivalents to a US/UK small. This country uses a very simple numbered system. You will see a size 55 for small in the US size, for example. 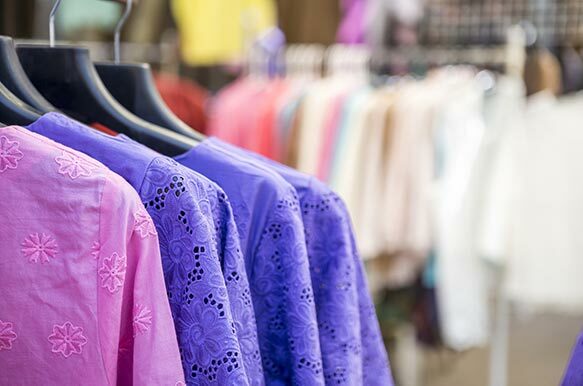 Now that you have a little idea of what to expect, this guide will help you navigate your way through Asian clothing sizes. Keep in mind that the charts below are standardized. Clothing sizes may vary between brands and it is still best to follow their individual size charts if available. Take a look at our comprehensive size charts below for an easy comparison. A more detailed discussion on women’s clothing sizes is available here. This article on men’s clothing sizes might interest you as well. To learn more about shoe sizes, click here. Shopping for clothes is something most people would consider a stress-reliever. But when you take a look at sizes and their different standards of measurement, the prospect could actually become stressful. Unfortunately, there are no universal sizing guidelines when it comes to clothing. This makes size conversion a necessary evil that any consumer needs to have. In this instance, for example, Asian clothes are generally smaller fitting compared to the UK and American sizes. Some larger sizes are not even available in most Asian stores, due to the smaller natural build of people in Asia. This is why it is essential that you understand size conversions to avoid unnecessary mistakes or waste of money when you are shopping. When buying clothing, there are usually things you consider according to your needs and preferences. In Asia, particularly, with such a variation in style, design, and sizing – there are even more things to think about. You tend to ask yourself, am I making a sound purchase? Is this the right size? Here are some things you need to put into consideration before you fill your cart with clothes. Pay attention to size: As reiterated time and again in this guide, you need to pay a particularly close attention to size. Asian sizes can be ridiculously small and you don’t want to end up having a bunch of clothes you can’t fit into. If an item runs in “free size” or “one size” do not buy it if you are a size 4 or above in the US. Some areas of the body, particularly the chest and shoulders, may be a bit smaller than you are used to. If you are a woman who goes on the bustier side, perhaps Asian clothing might not be tailored for you. The same thing applies to height. Quality: If you’ve noticed, clothes from China can be cheap. This means you are not usually assured of the quality of the clothes you are buying, especially if you are shopping online. If you can, be sure to observe the fabric these clothes are made of. If they are made of any synthetic material’s like dacron or polyester, then the quality may not be so good. When shopping online, be extra cautious. Most of the time, items don’t look exactly the same in real life and you will end up disappointed. If buying online, communicate with the seller and be patient: Online shopping has become a big thing and I am sure you have had your fair share. If you are buying from an online seller, it would prove useful to communicate with them. Ask them questions as to the quality and the particular size of the item you are purchasing. This will help give you more assurance with your purchase. Additionally, practice patience. If you are buying from the other side of the world, then you shouldn’t expect your purchases to arrive on your doorstep the next day. These things take time, so you better consider that before buying a dress for your prom when it’s only a week away. Here you can find more infomation about shoe sizes and pants sizes. Asian sizes tend to run smaller compared to US or UK sizes. They tend to vary per country, but the most common sizes are from China, Japan, and Korea. China uses two different sizing systems, which measure two different parts for the body. For example, a US size medium is a size 88-90 or 165-170 in China. Japan uses the lettered sizing system (XS-XL), which tend to run smaller than US or UK sizes. The country also uses two numbered sizing systems as well. For example, a size 9 or 38 is the equivalent of a US/UK small. Korean clothing has a very simple numbered system. A size 55 is the equivalent of a US size small. If a clothing item runs in “free size” or “one size,” do not buy it if you are a size 4 or above in the US.